A set of architectural drawings of the Mackintosh Building, which are the most comprehensive drawings of their type in existence, have been donated to Archives and Collections at The Glasgow School of Art it was announced today. The drawings will be used in the restoration of the Mackintosh Building, and will be a resource for academics, students and the public. Professor Tom Inns, Director of The Glasgow School of Art, examines one of the special set of drawings donated to the GSA. 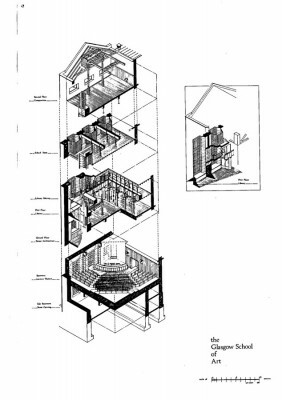 The drawing shows the west wing including the lecture theatre, the library and the top floor studio. The set of 22 “A1” size drawings, most at 1:100 scale, were made by George Cairns whilst he was undertaking a Phd at The Mackintosh School of Architecture at the GSA in the early 1990s. They are of the Mackintosh Building as it was completed in 1909, as accurately as could be determined from available records. Cairns, who is now Adjunct Professor at QUT Business School, Brisbane, is visiting Glasgow for the inaugural Leverhulme International Network of Contemporary Studies symposium and he presented the plans to the GSA this morning. 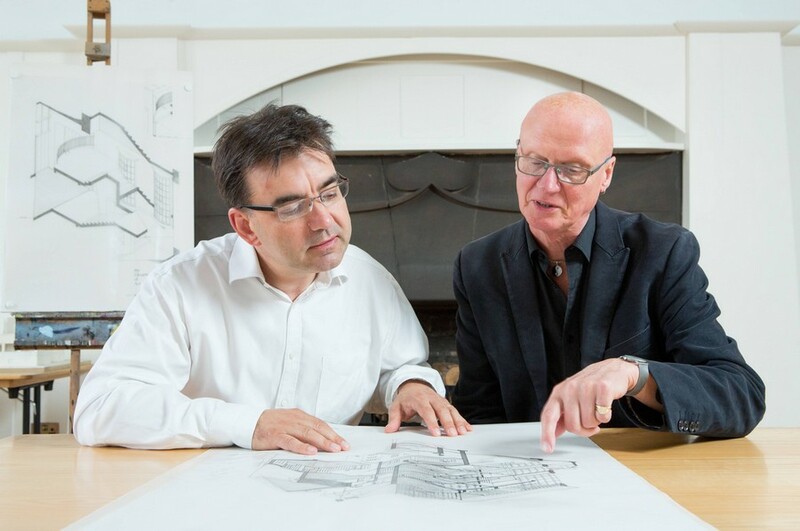 Professor Tom Inns, Director of The Glasgow School of Art, and Professor George Cairns examine one of the “invaluable” architectural drawings which Professor Cairns has given to The Glasgow School of Art. The plans will be added to the significant archive of material relating to Mackintosh’s masterpiece that is held in the Archives and Collections at the GSA. The drawings will now be digitised and will accessible for academic and public research through the GSA’s online archives in the coming months. This is the second public symposium on the Mackintosh Building. Hear about the challenges of working with a Category A listed building, and what new insights the fire has revealed about the original construction of Mackintosh’s masterpiece. In the morning expert panellists present papers on issues facing the GSA in the aftermath of the fire. At lunchtime meet the newly appointed lead architects and hear about their initial thoughts for the restoration programme. In the afternoon join workshops to explore in detail themes ranging from 21st century Libraries to contemporary craft, future-proofing historic buildings and ideas of authenticity in cultural artefacts. The day is chaired by and will end with a keynote address from one of the UK’s leading Architecture Critics, Rowan Moore. 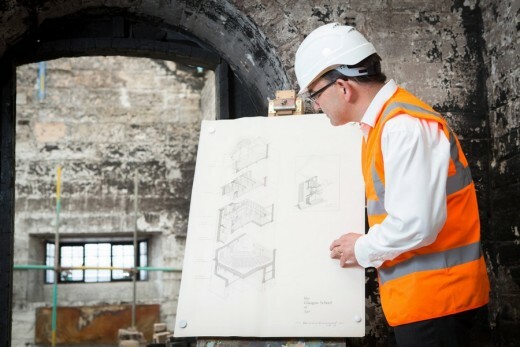 There was a major step forward in the restoration of the Mackintosh Building today, Tuesday 31 March 2015, as The Glasgow School of Art announced the appointment of a design team led by Page Park Architects. The appointment was made following presentations by a shortlist of five architecture practices earlier this month. 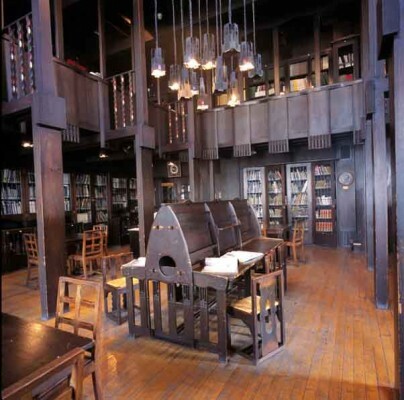 The Glasgow School of Art will name the architect practice expected to replicate the Mackintosh library, which was almost entirely gutted by fire, by the 31st of March. 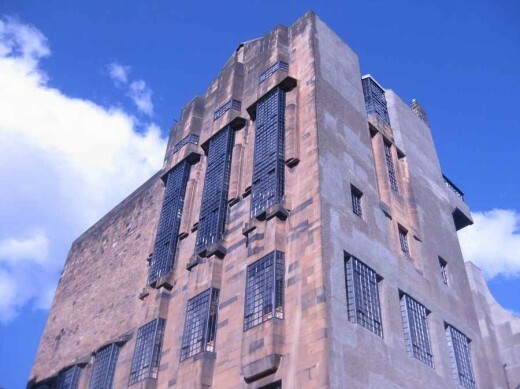 Tom Inns told the Scottish press he wanted The Mac library to be restored ‘as closely as possible’ to Charles Rennie Mackintosh’s original, according to the AJ. There has been an ongoing debate in the last year as to whether a more contemporary architectural design would be appropriate – with architects such as Alan Dunlop arguing in favour of a bolder approach (comments welcome). The GSA estimates that the cost of restoring the building could reach £35m. Scottish ministers and the UK government have already pledged to contribute to a restoration fund that aims to raise £20m, reports The Guardian. The fund was launched in June by Brad Pitt and former GSA student Peter Capaldi. The recovery programme is expected to be completed by 2018. The architect have been shortlisted for the restoration of the Macintosh building in Glasgow and were selected from 14 entries via PQQ. There were around 100 expressions of interest from around the world but that there had been a high drop-out rate when architects saw the detailed requirements. They have nine weeks to come up with more detailed proposals and costings. Presentations to a panel of GSA staff and external specialists will take place in March with the winner announced later in March. Fourteen architecture studios have formally registered their interest in wishing to be involved as architects in the restoration of Glasgow School of Art’s Mackintosh building, reports the AJ today. There were 100 initial expressions of interest from architects. 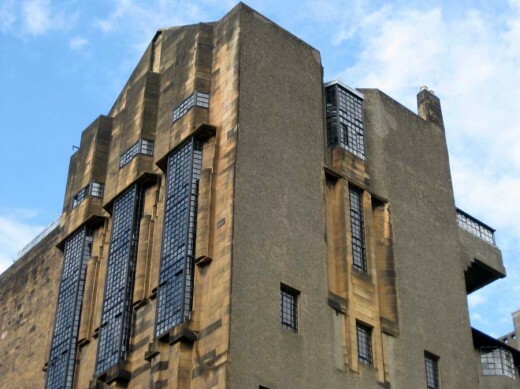 Glasgow School of Art (GSA) has pledged to “bring back” the Mackintosh building after a fire two weeks ago left the iconic structure badly damaged. In an emotional open letter of thanks to those who helped in the aftermath of the fire, the governors said their first priority was to help students. A restoration fund has already drawn millions of pounds in pledges. About 200 firefighters were involved in tackling the blaze at its height. We at e-architect echo the sentiments expressed in the letter. Like every year we will attend the Degree Show, the annual showcase of work by graduating students across Architecture and Design, plus a curated exhibition from Fine Art, 14 – 21 June. Little further information online currently about The Mac, 90% of the builidng is claimed to be seaved, but very sadly not looking good for the GSA Library as far as we can see. Firefighters battling the blaze at the iconic Macintosh Building in Glasgow City Centre have prevented the destruction of both the structure and the majority of its contents. Scottish Fire and Rescue Service crews are continuing work to fully extinguish the fire and save artworks. With the incident under control indications are the firefighters’ efforts have ensured more than 90 per cent of the structure is viable and protected up to 70 per cent of the contents – including many students’ work. 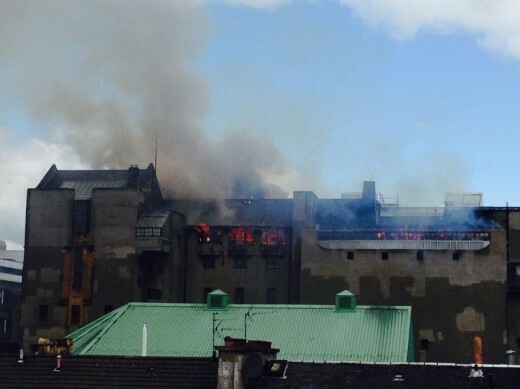 Fire crews tackle blaze at Glasgow School of Art. Fire crews are tackling a fire at the A-listed Glasgow School of Art in the centre of the city, reports the BBC today. Glasgow School of Art Fire : BBC report. The GSA is a world-famous building and we take regular architecture tours to see it outside and in, the key building in Scotland’s largest city. Unconfirmed report that it started from a spark igniting expanding foam, in the Basement. A key question would be why/how the fire was allowed to spread, where there sprinklers in the building and if not, why? The main spaces on the north frontage are simpler, but the Library on the west is intricate and wooden, we’ve trawled reprots but found no information on the Library, information is welcome. The president of the Royal Incorporation of Architects in Scotland (RIAS), Iain Connelly, said the value of the building “goes well beyond Glasgow or even Scotland”. President of the Royal Instutute of British Architects, Stephen Hodder, said: “The most important work by Charles Rennie Mackintosh, an architect of international significance, Glasgow School of Art, is held in the highest regard by architects and the public alike. “It was rightly judged to be the best building of the past 175 years, in a nationwide poll run by the Royal Institute of British Architects. “Damage to a building of such immense significance and uniqueness is an international tragedy. It is irreplaceable. “The RIBA joins our colleagues in Scotland in sending out a message to the students, staff of the School and all those who have been associated with this building over the decades. “It’s a message of sorrow and commiseration at this terrible, terrible news. A building with great heritage: the former Glasgow Herald building was remodelled by Charles Rennie Mackintosh to become his first major public building. Glasgow School of Art is probably the most well known Charles Rennie Mackintosh building and certainly his most well respected. Powerful sandstone block with dark, woody interior – save the bright hen run high up on the south facade – perched on a steep incline. This is architecture of global importance, recorded in most Histories of 20th Century Architecture. Powerful influence for Art Nouveau and later for Modernism. Hill House was designed for publisher Walter Blackie. After the Glasgow Art School, Hill House is one of Rennie Mackintosh’s best known buildings. Mackintosh’s style is often seen as not only related to fin-de-siecle Art Nouveau but to the burgeoning Modern Architecture movement. This Rennie Mackintosh building typically works with the Scottish traditional architecture, often referred to as the Scots Baronial, the rustic architecture of towers and crow steps. Charles Rennie Mackintosh building constructed to his original plans in Bellahouston Park. 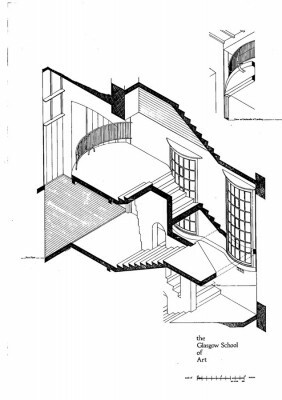 The House for an Art Lover resulted from a competition design by Charles Rennie Mackintosh in 1901. House for an Art Lover was built on the former site of Ibrox Hill House in 1989-96 with the assistance of the City Council. Graham Roxburgh and architect Professor Andy Macmillan were instrumental in creating Rennie Mackintosh’s House. Glasgow Tea Rooms for Kate Cranston. There is a similar Rennie Mackintosh Tea Room at 97 Buchanan Street. Interior of a Mackintosh-designed house formerly at 78 Southpark Avenue, where the architect lived from 1906-14.